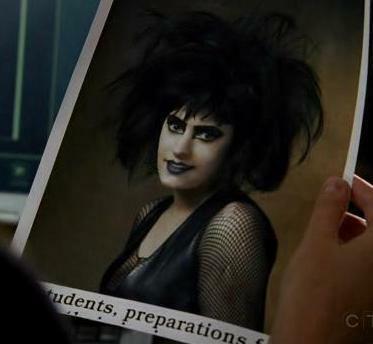 Emily Prentiss as a Goth Chick in the 80's :). Garcia and Reid make fun of Prentiss after Garcia hacked Emily's high school pics and find out she used to "rock the goth look" back in the good ole confusing 80's :). Wallpaper and background images in the Esprits Criminels club tagged: emily prentiss criminal minds goth chick season 3 goth 80's. This Esprits Criminels Screencap might contain signe, affiche, texte, tableau noir, tableau, and affiches. Lol I loved the way she thought Garcia had photoshopped it when she hadn't!! :D OMG!!! From wich episode is? I have to watch this! LOL Suzy And The Banshees Concert LOL!!!!! !